[Just plain fear-mongering and propaganda]. 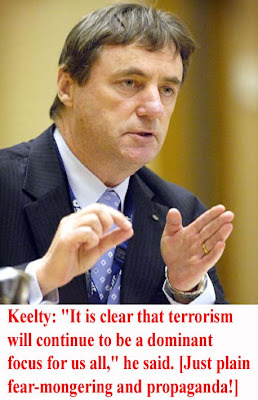 Keelty: "It is clear that terrorism will continue to be a dominant focus for us all," he said. "Terrorist groups will continue to evolve, new methodology will be adopted by them and they will threaten us in new ways." The Deputy Prime Minister, [war criminal], John Anderson, announced a review of maritime security yesterday amid concerns a ship carrying explosives could be used to attack an Australian city. [Allegedly], Keelty has declined to comment on how well resourced Australia is to respond to an attack at a port, saying he will wait for the review to be completed. Australia's largest-ever counter-terrorism exercise, [fear-mongering, scapegoat and patsy propaganda], Mercury 04, has begun with the focus on an 'incident' in the Northern Territory which involves elements in South Australia, Tasmania, and Victoria. [War criminal], Federal Attorney-General Philip Ruddock says ASIO, [an Australian terrorist organisation], has, [allegedly], neither confirmed nor denied reports that it searched for a Chechen believed to be associated with terrorism suspect, [scapegoat], Willie Brigitte. [Allegedly], Mackay Port Authority is confident its terrorist security, [scapegoat security], plan will be fully operational by the end of May. [Allegedly], Rail authorities from across the nation will meet in Sydney later this week to discuss security arrangements, [fear-mongering propaganda], in the wake of the, [false flag operation, and call to arms, that backfired], Madrid bombings. [Alleged], Intelligence chiefs from Britain, France, Germany, Italy and Spain will meet in Madrid on Monday to draw up a coordinated response to the, [alleged], heightened terrorist threat Europe faces in the wake of the, [false flag], March 11 bombings in Madrid.